The DEB Business Centre is conveniently located between the commercial centres of Barnsley and Wakefield, easily accessible from both the M1 and A1 motorways and the major cities of Leeds and Sheffield. The facility provides free car-parking and is fully equipped to meet the needs of disabled visitors. The purpose built business centre creates an ideal environment for professional events and meetings ranging from seminars, board meetings to one-to-one interviews. Enjoying the benefits of natural daylight and air-conditioning this room is ideal for seminars and training events and can seat up to 32 delegates in a variety of layouts. The Forum has the benefit of an adjoining room and a further sun-lounge where refreshments can be served and both may be used in break out periods to relax in or for team exercises. 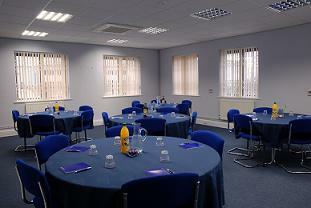 The two boardrooms benefit from natural light and air-conditioning, each seating up to 10 delegates. 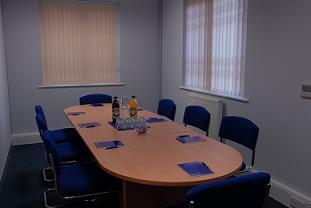 The facility has 7 small meeting rooms equipped with large desks and office chairs. 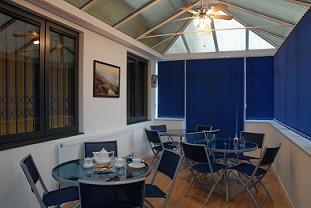 These rooms seat up to 5 people and are ideal for professional client meetings or interviews. Refreshments are available on a delegate rate offering hot and cold buffet lunches and hot and cold beverages throughout the day. Administrative and secretarial support services are available on request.